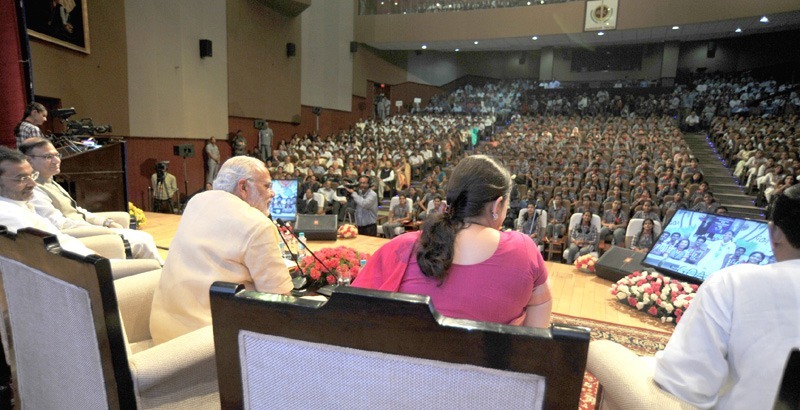 The Prime Minister, Shri Narendra Modi, today interacted with school children from across the country, on the eve of Teachers' Day. In a unique event anchored entirely by school children themselves, the Prime Minister released commemorative coins of denomination Rs. 125, and Rs. 10, to mark the birth anniversary of India's second President, Dr. Sarvepalli Radhakrishnan. The Prime Minister also launched the website for Kala Utsav, an initiative of Ministry of Human Resource Development (MHRD) to promote arts in education by nurturing and showcasing the artistic talent of school students at the secondary stage in the country. In his opening remarks on the occasion, the Prime Minister said that there is a special significance of interacting with school children on the eve of Teachers' Day. He said a teacher is known by the accomplishments of his students. He said that while a mother gives birth, it is the teacher who actually provides life.